Get Well Gabby | 2012 Holiday Book Drive is Underway! When Gabby was sick, books were one of the few ways she could escape her hospital room for a few minutes. Things that used to be simple for her, like watching TV, were very difficult for her in the hospital. 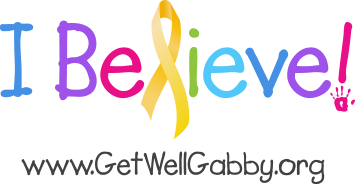 This year, The Get Well Gabby Foundation would like to do something for the children with cancer who can’t leave their hospital rooms this holiday season. We are hosting a book drive to collect NEW books to distribute for children at The Children’s Hospital of Philadelphia, Nemours/AI Dupont Hospital for Children, and Penn State Hershey Children’s Hospital who are inpatient over the holidays. The Get Well Gabby Foundation will be sponsoring a catered dinner for the patients and their families when the books are delivered. Many of these children can not even leave their rooms during their treatment because their treatment weakens their immune system to the point where a case of the sniffles can be life-threatening. Everyone who comes to see them must wear a full gown and mask before they can get close. Please help us brighten at least one child’s holiday by donating a new book for them. You can purchase new books or gift cards for books and mail them to us at PO BOX 555, Ocean View, DE 19970. You can purchase books or drop them off at a participating book store that is collecting books for us. As of today these are Chester County Book and Music Co. in West Chester, PA and The Children’s Book Garden in Ocean City, MD. You can visit this page for an up-to-date list of participating stores. You can work with your child’s school during the upcoming Scholastic book drive. Several Phoenixville, PA area schools are already involved. Send this page to your Facebook friends! Run a book drive at your School, Club, or Church and send us the books! Contact your favorite bookseller and ask them to become a collection point for us! You can send a donation to the Get Well Gabby Foundation and note that your donation is for the book drive. However you choose to support us, we need your books by November 15th, 2012 so we can have your book in a child’s hand to brighten what could be an otherwise very lonely holiday. Thank you for helping us help these children. With the holidays fast approaching, don’t forget about Piggy Paint’s Pedi-“cure” sets for the special girls in your life. You can give them a gift they will use every day: Non-toxic, Natural as Mud™ nail polish and 25% of your purchase price goes directly to support The Get Well Gabby Foundation mission. Visit the Piggy Paint website and enter the promo code WeLoveGabby when you check out. You get 15% off your order and FREE shipping on any order over $40! If you don’t know what color they would like get them a Gift Certificate and let them choose exactly what they want!